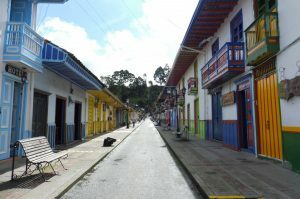 Salento is a small town in the Coffee region (Zona Cafetera) of Colombia, close to cities like Armenia and Pereira. 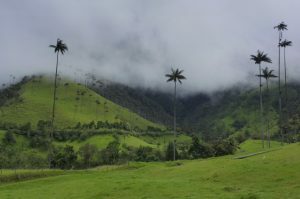 This town is famous for its coffee farms and the unique landscape of the Cocora Valley (El Valle de Cocora) with the world’s highest palm trees. The average temperature in this region is only 17 degrees and it can get quite cold when its rainy, windy and cloudy. The town is very cute with colorful houses, a plaza, a church and some restaurants. 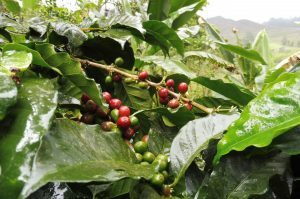 There are a few coffee farms offering tours and the prices depend on the length of the tour. I decided to do the tour with Don Elias, because it is the cheapest and it has a good reputation in town. It took me 1 hour to walk from my hostel to the farm and I stopped a few times to enjoy the great view over the wide landscape. 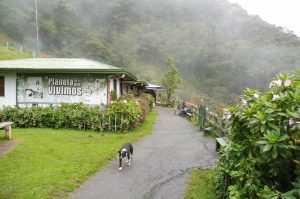 The other coffee farms are on the same road and Don Elias is one of the last ones. There are also taxis taking you to the farms for 1€ (3.000 COP). Don Elias is a small farm, managed by a family. They showed us around the farm and explained very detailed how the coffee is growing, harvested and processed, until it’s ready for the costumer. Don Elias is selling its coffee for example to the famous company Segafredo in Italy. Don Elias coffee is special because it’s organic and no chemicals are used. 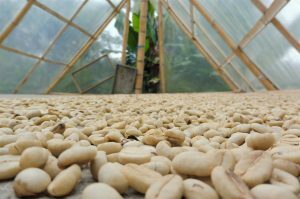 Organic waste is used for the soil and other plants protect and help the coffee grow. 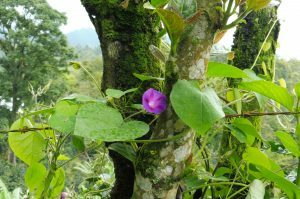 For example, the coffee plants are covered with a mix of water and chili to protect them from insects. Plantain trees are saving water in their trunk. If you press against a plantain plant, you will see that there is water coming out. So if there is no rain, the plantain tree gives water to the coffee plant. Furthermore, the big leaves provide shade and protect the coffee from the sun. It’s very interesting to learn and see locals producing products in a natural and sustainable way. The tour took around 30 minutes and is 3 € (8.000 COP). If you want, you can buy their coffee: 250 G for 4 € (12.000 COP). 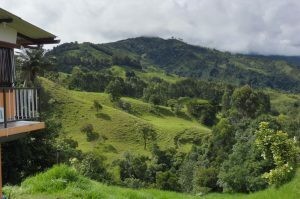 El Valle de Cocora welcomes you with a beautiful scenery of green hills and the largest palm trees in the world. 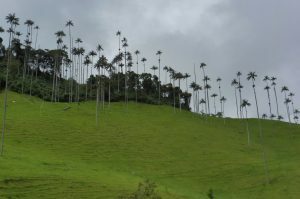 The wax palms (palma de cera) can grow up to 60 meters! You can either hike the trail, which took me 5,5 hours or you just have a look at the big palm trees. The trees are right at the beginning of the hiking trail; you just have to walk 10 minutes from where the taxi drops you off. The entrance fee for the valley is 1 € (3.000 COP). Of course I hiked the whole trail and it was a great, but exhausting experience. 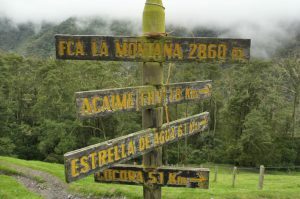 The first part of the trail is uphill for around 1,5 hours, until the first stop at the Finca la Montana. I took a short break and warmed up with a cup of hot chocolate, because it was cold and rainy. From now on the trail got a bit more varied. The forest is very beautiful with big trees and a green landscape. I was walking next to streams and had to walk over old swing bridges to cross rivers. It rained a lot, so even the usually small rivers were very wide and strong. The whole trail is a loop and on the way back it was not that easy to find the junction to reach the other part of the trail. 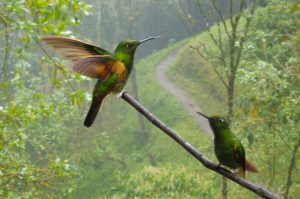 From the Hummingbird Reserve, I walked the same way back that I came from, for 1 km. 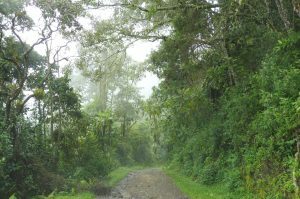 Before hiking up the hill which leads back to Finca la Montana, you have to walk to the left to continue the loop. Because of the heavy rain a river arose and I had to walk through it, before even seeing the trail. Without asking other hikers, I would have missed it, there are no signs. The last hour of the hike was walking through mud, next to meadows and fields. And I’m talking about a lot of mud! People even lost their shoes in it. I borrowed rubber boots from my hostel (1 €) and it was my favorite equipment on that day. With the rubber boots it was so much easier walking through the rivers and mud. The whole hike took me 5,5 hours. It was constantly raining and misty. I was totally wet, cold and exhausted at the end. The hike is not easy, because some parts are quite steep, rocky and you have to walk through rivers. 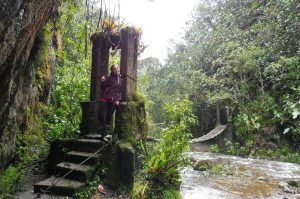 But this is why I liked the trail that much: it was diverse and fun – a bit like an obstacles run in a beautiful landscape. The taxis are waiting on the plaza in front of the church. They leave anytime the car is full, it takes 30 minutes to the valley and the ticket is 1,30 € (3.800 COP). The hiking trail ends at the same point where it started and the drivers are waiting there to bring people back to town. Borrow rubber boots for hiking if it’s raining! In Salento I stayed at La Floresta Hostal. It is cheap, the equipment basic and it has a nice garden. It doesn’t really matter where to stay in Salento because the town is that small that you only take 15 walking minutes to get from one side to the other side of the town. The hostel offered mountain bikes for rent: 2 € (6.000 COP) for 1 hour or 12 € (35.000 COP) for 1 day and Horseback riding. Medellin to Salento: Buses leave from the Southern Bus Station in Medellin (eg. company Flota Oriente). It takes 7 hours and a ticket is 13 € (45.000 COP).